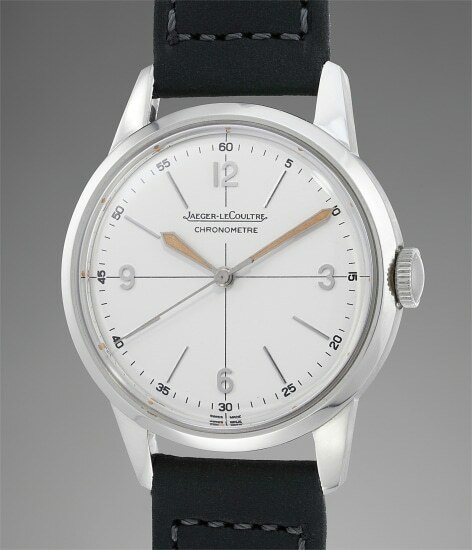 Accessories: Accompanied by Jaeger-LeCoultre Extract from the Archives confirming production of the watch in 1958. Possibly one of the finest stainless steel Geophysics to ever appear on the auction market, the present watch was originally consigned by the family of the original owner when it first appeared at auction. Offered in unpolished condition, it most notably features a beautiful enamel medallion on the caseback along with an original Jaeger LeCoultre buckle, attesting to its appealing condition. Furthermore, all the luminous dots are present in the rehaut, showing the little, if any wear the watch has seen throughout its lifetime. Housing Jaeger-LeCoultre's most prestigious chronometer movement available at the time, the Geophysic was made to withstand the elements. Launched in 1958, it was in production for one short year only. The model was made to celebrate two events. While its launch commemorated the 125th anniversary of the manufacture, it also marked the very first International Geophysical Year. The Geophysic perfectly embodied the values of the International Geophysical Year (IGY) due to its antimagnetic, antishock and waterproof abilities. Scholarship suggests that no more than 1000 examples of the Geophysic model were ever produced.